You’ve decided you definitely want to sell your junk car, and you’ve even made a few phone calls to local junk car buyers. As far as you’re concerned, the sooner your junk car is gone, the better. The whole process has got you thinking, though: what exactly happens to a junk car when you sell it? Where do junk cars end up? Are they broken down into parts? If so, what’s the final destination for all of the scrap metal that can’t be immediately reused in another vehicle? We’ve put together this blog post to explain exactly what happens to your junk car after you sell it to a junk yard. As you’ll see, your vehicle’s constituent parts end up in a lot of different places. Have you ever considered just how much liquid there is in your vehicle? It’s not just gas and oil, either. There’s also freon in your air conditioning system, antifreeze, and all sorts of other fluids: brake fluid, power steering fluid, transmission fluid, and more. It’s not unusual for a vehicle to have ten gallons of all sorts of different fluids spread throughout its component parts. As you can imagine, pouring all of these liquids down the drain is neither safe nor legal. That’s why junk yards have to remove these fluids and deal with them on an individual basis. What happens to the fluids after they’re removed and shipped off for recycling, though? Well, engine oil can basically be cleaned and then reused as new engine oil. Freon can also be reused, as can antifreeze. Some junk cars are full of parts that are more rust than anything else. However, many junk cars have parts under the hood that still work. When you sell your vehicle to a junk car, they’ll remove any of its constituent parts that can be sold on their own for use in other vehicles. Common examples of these kinds of parts include batteries, alternators, starters, transmissions, and even entire engines. Exterior parts such as mirrors, windows, and bumpers are often removed piecemeal as well. Even though removing your junk car’s fluids and spare parts is an important part of the recycling process, the reality is that the vast majority of your vehicle is made up of scrap steel. Once the fluids and spare parts have been removed, the steel “shell” of your vehicle is crushed flat and shredded into small chunks for further processing. These chunks of metal are shipped off to be melted down and reformed into new steel. In fact, a large portion of your vehicle will likely end up in new cars! Now that you know what will happen to your junk car after you sell it, it’s time to get as much cash for it as you can. Rusty’s Auto Salvage can beat any other offer in the area! 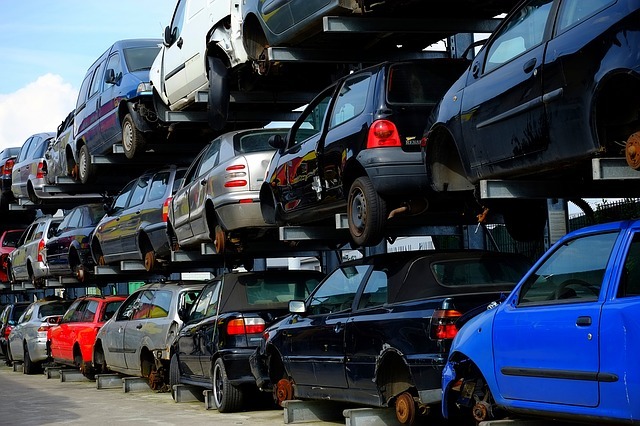 Call us at 888-309-1017 and get an instant quote for your junk car. They gave me the best price for my truck and came on time. The pickup driver was very helpfull with the paper work and I had my money the same day.